Lonnie Wheatley, LITTLE ROCK, Ark. 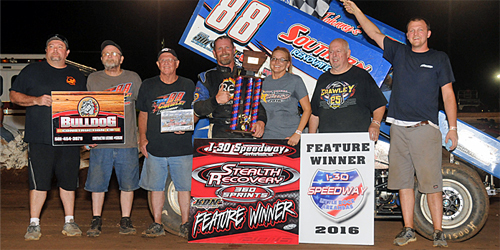 (July 9, 2016) – It was an ideal Mid-Summer appetizer for I-30 Speedway’s Short Track Nationals. Money was tossed around haphazardly and the resulting no-holds-barred action on the high-banked, ¼-mile oval had the large crowd abuzz. In the end, it was local legend Tim Crawley adding another page to the lengthy volume by snaring the $5,000 winner’s share aboard Mike Ward’s No. 88 Sprint Car in the 30-lapper. 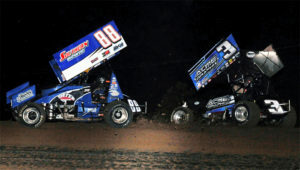 It was the third consecutive win for Crawley at the I-30 Speedway oval near his Benton, AR, home. Crawley steered clear of a pair of incidents within the opening two laps and then somehow survived a slider gone awry on early leader A.G. Rains to capture the win. Throw in some added money though, and Crawley’s determination was too much. He willed that mule to the head of the pack. After picking up an extra $200 by winning the Dash for Cash to earn the pole position for the feature, the ante was upped further when Crawley was offered a challenge. The challenge was to start the feature from the tenth starting position. The reward? A guaranteed $1,000 bonus regardless of the outcome, assuring a minimum of $1,300 if he finished last. Toss in another $1,000 on top of that to make for a potential $5,000 winner’s share instead of the posted $3,000. Never one to back down from a challenge, Crawley jumped on the opportunity. “I really have to thank I-30 Speedway for putting that extra money up, it’s always fun to have an opportunity to race for more,” Crawley said afterward. Gridding the field tenth, Crawley’s job was made easier when front row outside starter Howard Moore looped it exiting turn two on the opening lap, collecting a handful of cars. Crawley restarted sixth after the opening lap melee and was in second after one lap when front runners Cody Gardner and Andy McElhannon made contact that sent both to the pits prematurely with suspensions damage on both machines. With Rains leading the way on the restart, the chase was on with Crawley in second. Crawley was making little headway before stepping up the pace after ten laps. A dozen laps in, Crawley threw a bid slider at Rains entering turn one with contact resulting. The crowd viewed the incident with mixed emotions. Half seemed to approve while the other half insisted that heads must roll. Crawley somehow survived the contact that sent booth cars veering the wrong direction towards the edge of the turn two banking. Rains slipped over briefly before picking up the chase several positions back while Crawley somehow managed to right his machine. But not before Kyle Bellm ducked by on the low side to take the lead. At least for the moment. Crawley gathered himself back in and battled back around Bellm for the lead the next time around with two-time Short Track Nationals champion Tony Bruce, Jr., throwing his hat into the mix by taking over second another lap later after starting 13th. One final caution just after the midway point gave Crawley time to settle down and a clear track ahead, and there was no stopping him. He cruised to the checkered flag over the final 14 lap portion to secure the $5,000 triumph. Spending the weekend aboard the Missouri-based Smith Racing No. 86, a semi-retired Bruce, Jr., finished out the night in second while Rains recovered from the mid-race dramatics to claim the show position. After leading briefly, Bellm fought a worsening car to outlast Ernie Ainsworth for fourth. Fireworks in the air and fireworks on the track, it definitely had a hint of that Short Track Nationals atmosphere in the air as Crawley took home $5,500 in winnings with bonuses added in on top of first place money. And he clearly put himself in leading contention to capture a second Short Track Nationals crown in November to go along with the first one he captured 18 years ago. Heat Winners (starting position in parentheses): Dakota Gaines (1), A.G. Rains (2), Tim Crawley (1). Heat Moments: James Mooney flamed up momentarily in the third heat to bring out the only caution; Boxed behind a pair of Hinkles in heat two, eighth-starter Howard Moore slipped by Brandon (Hinkle) on the last lap to capture fourth in the second heat and land a spot in the Dash for Cash; Kyle Bellm makes a last corner pass of Johnny Gardner to snare third in the final heat race. Dash Winners (starting position in parentheses): Tim Crawley (4). Dash Moments: Handed the four pill in the six-car revenge draw for the Dash, Crawley chased in third for two laps before blasting past Moore for second on the third lap and then easily disposing of Dakota Gaines for the lead the next time around. Original start – Front row outside starter Howard Moore spins exiting turn two with Dakota Gaines, Joe Young, Zach Pringle, Jordon Mallett and Johnny Gardner all caught up in the mess as Brandon Hinkle sails off the top of turn two to avoid the mess. Only hurt feelings as Moore, Gaines, Hinkle and Gardner are done. 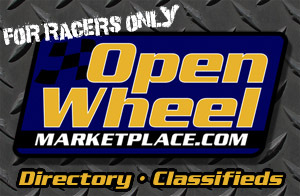 1 Lap – Leading the way, Cody Gardner exits turn four and pops a big wheelie. The front end comes down hard and he shoots to the outside and gets together with second-runner Andy McElhannon. Both come to a stop in turn two with an assortment of damaged pieces. 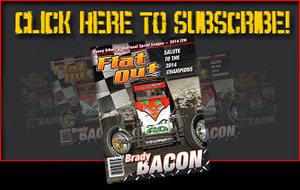 6 Laps – Mooney repeats his heat race flame up. 16 Laps – Blake Jenkins blows up and gets no further under his own power than the top of turn one. $100 Highest Finishing Driver among Top ten in Riverside International Speedway points to Tim Crawley courtesy of Clayton & Sherry Allen. Feature purse boosted to $3,000 to win and $300 to start courtesy of Stealth Recovery, KDN Promotions, Little Man Beef Jerky and Bulldog Construction. $575 in the Dash for Cash courtesy of Xtreme Towing & Recovery (Douglas Babb & Daryl Conrad). 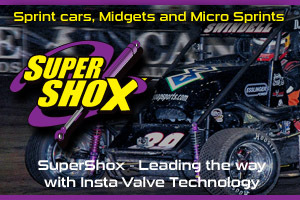 Added $2,000 challenge to Tim Crawley to win from tenth, bringing winner’s share to $5,000 courtesy of I-30 Speedway. Heat One (8 Laps): 1. D6-Dakota Gaines, 2. 99-Blake Jenkins, 3. 2g-Cody Gardner, 4. 86-Tony Bruce, Jr., 5. 8z-Zach Pringle, 6. 43-Matthew Bauldwin, 7. 91a-Ernie Ainsworth, 8. 32x-Robert Richardson. Heat Two (8 Laps): 1. 3-A.G. Rains, 2. 42-Andy McElhannon, 3. 21-Kevin Hinkle, 4. 40-Howard Moore, 5. 21b-Brandon Hinkle, 6. 15J-Jeremy Middleton, 7. 5k-Jerry Kamer, 8. 4-Tommy Snellgrove. Heat Three (8 Laps): 1. 88-Tim Crawley, 2. 14m-Jordon Mallett, 3. 14k-Kyle Bellm, 4. 31g-Johnny Gardner, 5. 12T-Joe Young, 6. 38-Rick Pringle, 7. 69-James Mooney. XTreme Towing & Recovery Dash for Cash: 1. 88-Tim Crawley ($200), 2. D6-Dakota Gaines ($125), 3. 40-Howard Moore ($100), 4. 42-Andy McElhannon ($75), 5. 2g-Cody Gardner ($50), 6. 3-A.G. Rains ($25). “A” Feature (30 laps): 1. 88-Tim Crawley (10), 2. 86-Tony Bruce, Jr. (13), 3. 3-A.G. Rains (6), 4. 14k-Kyle Bellm (8), 5. 91a-Ernie Ainsworth (19), 6. 8z-Zach Pringle (11), 7. 43-Matthew Bauldwin (18), 8. 14m-Jordon Mallett (5), 9. 2g-Cody Gardner (3), 10. 21-Kevin Hinkle (12), 11. 12T-Joe Young (14), 12. 5k-Jerry Kamer (20), 13. 32x-Robert Richardson (23), 14. 4-Tommy Snellgrove (14), 15. 15J-Jeremy Middleton (15), 16. 99-Blake Jenkins (7), 17. 38-Rick Pringle (16), 18. 69-James Mooney (21), 19. 42-Andy McElhannon (4), 20. 31g-Johnny Gardner (9), 21. 21b-Brandon Hinkle (17), 22. D6-Dakota Gaines (1), 23. 40-Howard Moore (2). Lap Leaders: Cody Gardner 1, A.G Rains 2-11, Tim Crawley 12, Kyle Bellm 13, Tim Crawley 14-30.